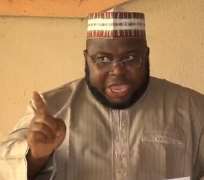 Niger Delta activits, Alhaji Mujahid Dokubo-Asari, was ion Tuesday arrested by police in Benin republic. His lawyer, Festus Keyamo announced the arrest in a statement. 'He was picked up around the Lubeleyi roundabout and taken to an unknown destination. We want to emphasise that Alhaji Dokubo-Asari carries on legitimate business and has been living partly in Benin Republic for many years now. In fact, he owns houses, schools and an academy in that country. All these places have been searched as at this evening and nothing incriminating was found. 'We think his arrest and detention is a ploy by certain forces in Nigeria in unholy alliance with the Beninoise government to keep him away as 2015 approaches.